#NicerProblemstoHave are where do you put too much shopping when it does not fit in your helicopter ! 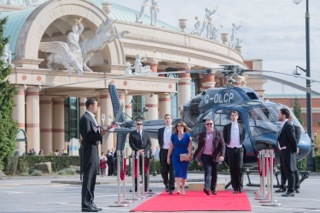 Charter-A Ltd provided the helicopter charter below to land at the Intu Trafford centre in Manchester, the first civilian helicopter landing at the Trafford Centre. See the video below or visit our Helicopter charter Manchester page for more details on Helicopter Charter. 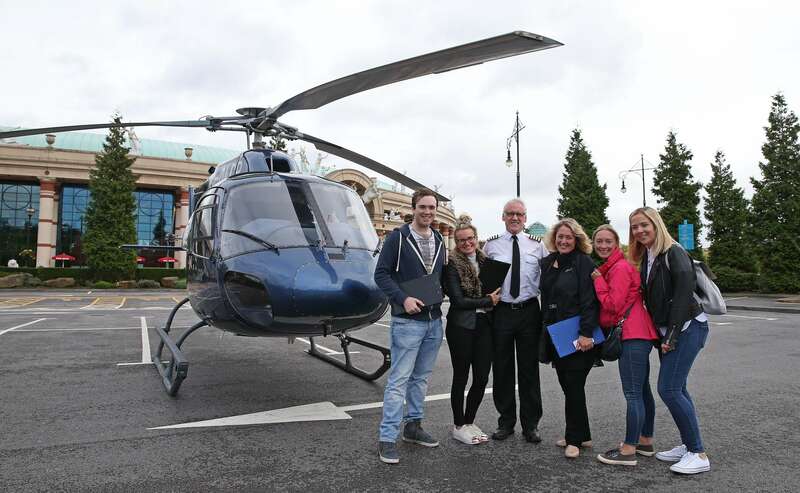 The award-winning PR agency, Influential, on behalf of their client, Camelot, worked with Charter-A Ltds Helicopter charter Manchester team on a national publicity stunt which has never previously even been attempted. To raise awareness of changes to the EuroMillions draw and the fact that a minimum of 208 millionaires will now be created every year just on EM, two of the North West’s biggest EM winners under-took a challenge. 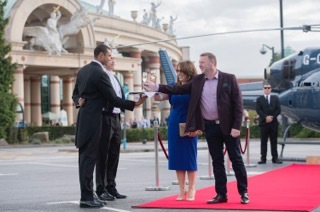 Sharon and Nigel Mather, from Cheshire, who won £12.4m in June, 2010, flew into Intu Trafford Centre in Manchester in a luxury helicopter. They received a red carpet and champagne welcome from a team of butlers who ensured their day ran smoothly and they had the best possible experience. A helicopter has never been allowed to land so close to this iconic building – but following months of painstaking work Influential and Charter-A Ltd made this happen! Influential arranged for them to be accompanied on their shopping spree by the team of actor butlers and security staff who carried all of their shopping for them and ensured they had a pleasurable time – no bags to carry and regular champagne stops! As the giant teddy Sharon fell in love with and bought couldn’t quite fit into the boot space … the couple called a limousine which took all of their shopping home for them – allowing them to board the helicopter for their return flight home. The stunt, which also involved a second helicopter flight ensuring aerial photography and video footage was captured, has received widespread coverage across TV, national, regional and local newspapers as well as massive social media traction.